Hannan freshman Bailey Coleman (13) dribbles toward a Scott defender during the first half of Thursday night’s girls basketball contest in Ashton, W.Va.
ASHTON, W.Va. — The Lady Cats didn’t exactly give it away, but miscues certainly didn’t help their cause either. 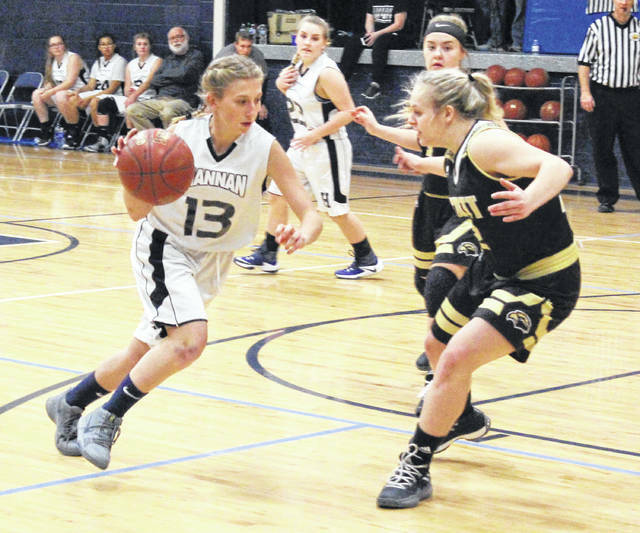 The Hannan girls basketball team committed 35 turnovers — 23 of which came in the first half — and visiting Scott led wire-to-wire Thursday night en route to a 60-47 victory in a non-conference contest in Mason County. The Lady Cats (0-3) had 11 of the 20 turnovers in the opening frame, yet never trailed by more than five points as the Lady Skyhawks (1-2) secured a slim 11-7 edge through eight minutes of play. 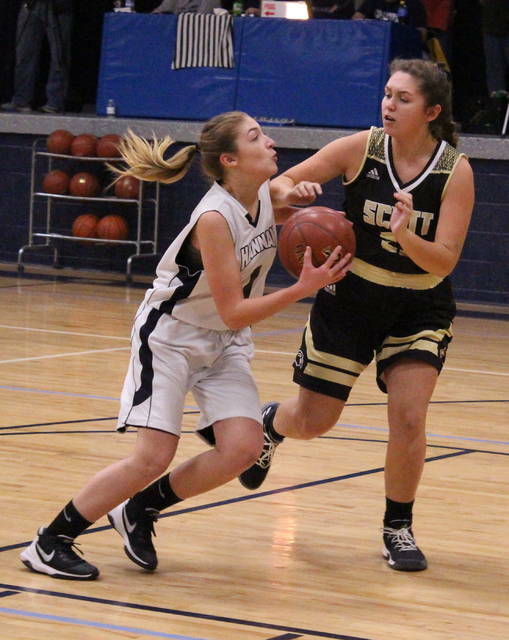 The Blue and White, however, had another dozen mistakes in the second frame, while SHS had only two turnovers during a 23-17 run to claim a 34-24 cushion headed into the intermission. HHS trimmed the second half lead down to seven points (34-27) following a Pammie Ochs trifecta 50 seconds into the third period, but the hosts were ultimately never closer the rest of the way. 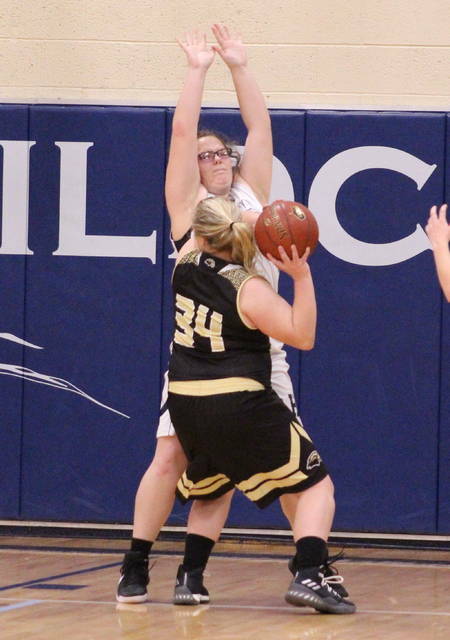 Scott followed with a 15-8 charge over the final 6:46 while taking a 49-35 lead into the finale, then made a small 9-8 run to take its largest lead of the night at 46-31 following a basket by Brooke Burns with 1:39 left in regulation. The Lady Cats — who outscored SHS by a 12-11 margin in fourth period — ended the final 75 second of the game on a small 4-2 run to wrap up the 13-point outcome. Hannan had one more turnovers than total shot attempts in the opening 16 minutes of play, something that ultimately played a hand in the final result. The hosts, however, did force 20 turnovers and also outrebounded Scott by a slim 44-43 overall margin — although the Black and Gold did claim a 19-10 edge on the offensive glass. HHS connected on 13-of-51 field goal attempts overall for 25 percent, which included a 2-of-14 effort from behind the arc for 14 percent. Hannan was also 19-of-28 at the free throw line for 68 percent. Julie Frazier led the Lady Cats with a double-double effort of 16 points and 17 rebounds, followed by Lindsey Holley and Bailey Coleman with seven markers apiece. Ochs was next with six points, while Hannah Carroll and Halie Johnson each contributed four markers. Josie McCoy completed the Hannan tally with three points. McCoy and Johnson also hauled in eight rebounds apiece in the setback. Scott netted 24-of-79 shot attempts for 30 percent, including a 5-of-27 effort from three-point range for 19 percent. The guests were also 7-of-15 at the charity stripe for 47 percent. Sara Mayse paced SHS with a game-high 21 points, followed by Burns with 16 points and Diana Birchfield with 15 markers. Emma Harmon was next with four points, while Emily Scott and Lily Bias completed the scoring with two points apiece. Kaylee Justice hauled in a team-best 11 rebounds and Harmon also grabbed seven boards. Hannan returns to action Monday when it travels to Rose Hill Christian for a non-conference contest at 6 p.m.